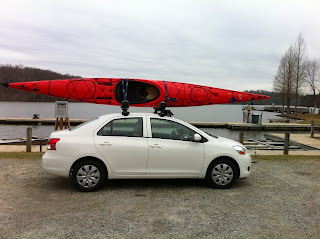 I finally got a kayak on top of the roof rack and on top of the car that will be driving to Alaska. It was nice to finally get into the water, it had been close to a month between weather, the drysuit and work. I met my wife for lunch after paddling in cold wet conditions and she immediately saw the difference in my mood. I am noticeably happier after kayaking, as I have said before it is my meditation. It sets my mind straight. And that is the joy of kayaking. I wish that the crossbars were a bit further apart, but the rear bar is just in front of the rear bulkhead, and the front bar is just behind a hull support that runs across the floor of the cockpit - I originally thought that bar was to stiffen the hull in the cockpit while paddling but when talking to Mark Hall of Delta kayaks he informed me that it for exactly the reason above. To stiffen the kayak when on a roof rack. While the fit of the rack is perfect - after many years of Yakima use, this Thule rack was the easiest fit I have ever done - the rectangular bars flex a bit more than I am used to when loading a kayak on board. Yakima's round bars are clearly stronger. I could have used the Thule Aero bars, but they are a bit more expensive. The absolute coolest thing though, is that the little Toyota Yaris has a removable tow hook on the front right side. Making a bow line easy to attach. No more crawling under the car looking for something to hook it onto. I did see about a 6 mpg drop with the roof racks on, I can only assume it will be worse with two kayaks up there. Hopefully the price of gas will drop back down by the end of June. I am still expecting you to drive through Lander. I have a 3 door yaris. I was wondering if you could tell me where you found your tow hook (is it anything special just for the car) and if there is another in the back? I'm getting ready to outfit my car for a kayak as well and I'm trying to figure out how to secure the front and back of the kayak to the car. Have fun on your trip, and thanks for posting pics. Looks great. 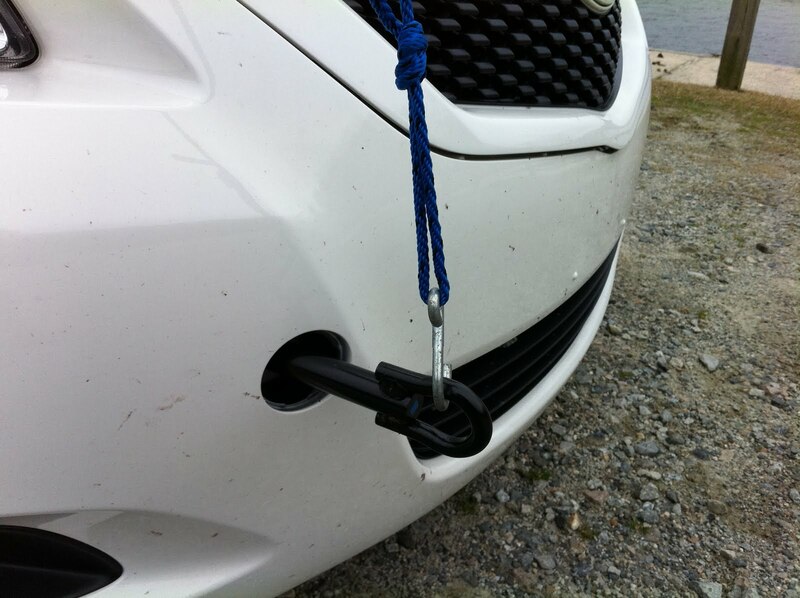 the tow hook is standard on the Yaris, and it should be located with your spare tire. Your front bumper should have a small circle that is easy to pry open, and this is where the tow hook goes. On the back, underneath the car are two (one on each side) circles cut in pieces of metal. you can easily mount a stern line to it. I will send you pictures of my car if you cant find them, but they are pretty obvious. I wanted the 3 door yaris but didn't get it because it is very difficult in terms of roof rack. Both Thule and yakima say they don't have a fit for it because the roof is so short. though if you look online you will see that some folks have figured out a fit. Good luck, let me know if you have any other questions. Thanks! Now that you mention it I do kinda remember seeing that thrown in with my car stuff. Thank you so much for the info. I wish I had the 4 door hatch-back because of the roof rack situation, but they aren't available in my area. So in the mean time I'm going to try and make a Thule fit kit work. Thank you again.